Traffic in Saigon with the Bitexco Financial Tower in the background. 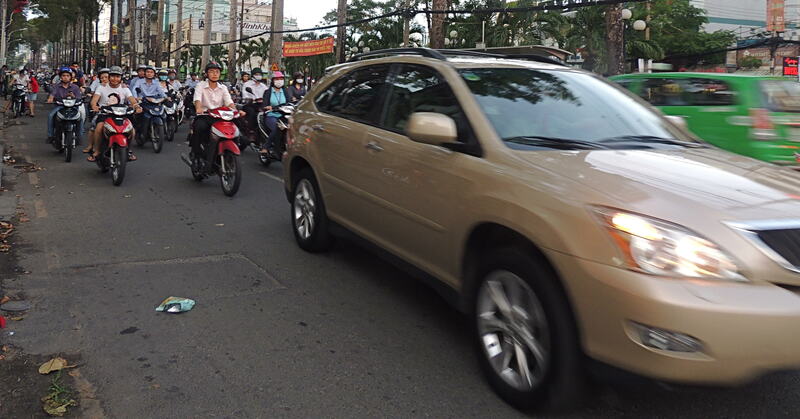 Sure, you’ve waited in traffic before, maybe an hour or longer for your commute, but this is nothing like the traffic you’ll experience in Saigon (Ho Chi Minh City). A bewildering barrage of motorcycles come in all directions. Traffic laws seem non-existent, and few pedestrian crossings makes crossing the street an adventure on its own. Since I’ve spent the past month here in Saigon, I’ve found waiting for traffic to clear is not going to happen. I have had to suspend my logic and walk into a street while motorcycles whizzed past me and prayed buses and cars slowed down for me to finish walking to the other side. 1. Look both ways before crossing the street. If traffic is clear on both sides, you’re lucky. Cross the street without problems. 2. If the above does not apply, wait for traffic to clear on your side of the street. Then walk until traffic starts coming at the other direction. Wait in the middle of the street until there’s a somewhat safe distance between you and the rest of the traffic. Continue crossing. Cars are a rarity on the roads. Motorbikes are the more immediate concern when crossing the street. 3. If traffic is super busy, you’re just going to have to man up and go. Wait for cars and buses to pass and look at motorcycle drivers on your side of the street. Don’t hesitate. You’ve made the decision to go. Make sure to watch traffic on your side of the street. Motorcycle drivers will avoid you. Cars should theoretically slow down. Wait in the middle of the street and repeat the process. 4. When in doubt, wait for a local and follow their lead. Congratulations. You just crossed the street without injury. Now, you get to do it again. 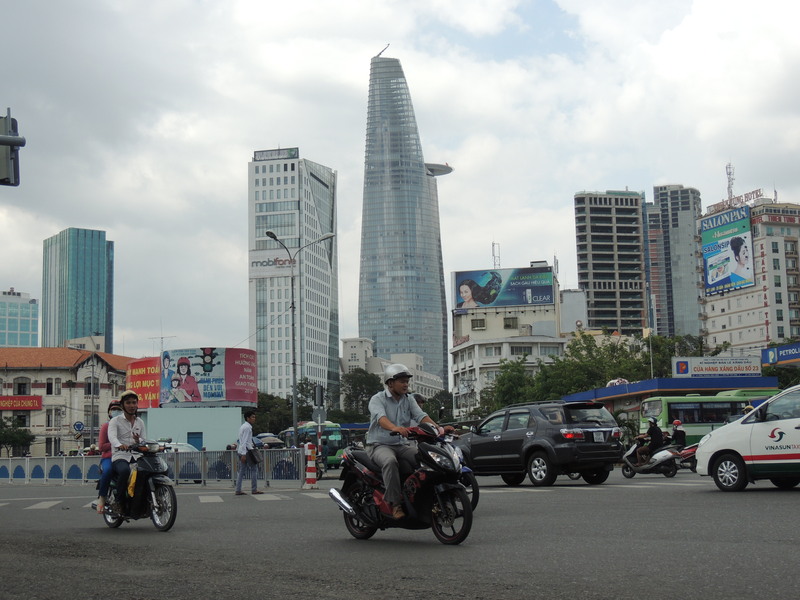 Fun fact: According to a 2008 Christian Science Monitor article, there are 3 million motorcycles in Ho Chi Minh City, or one for every two people. Thanks, Ryan! 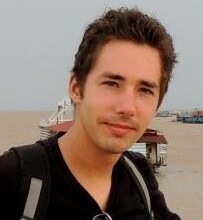 Thank you for showing me what to expect when crossing the busy streets of Saigon in December 2013. I know what I’m going to do when the time comes. I’m going to glue myself to a local crossing the street. LOL. Lol. I did the same thing when I first got to Saigon. It gets easier, and like I said, that was not rush hour.